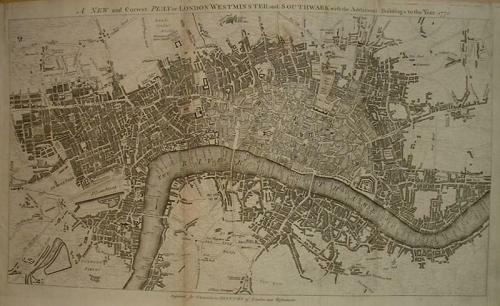 Title: 'A New & Correct Plan of London, Westminster and Southwark with the Additional Buildings to the Year 1770'. From "A New and Compleat History and Survey of the Cities of London and Westminster, the Borough of Southwark, and Parts adjacent; From the Earliest Accounts, to the Beginning of the Year 1770" by Henry Chamberlain, of Hatton Garden, published by J. Cooke, 1770. A large paln of London in very good condition. Minor overall toning.